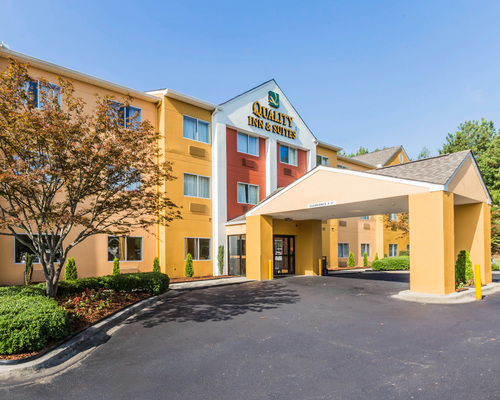 Conveniently located off Highway 280 and just minutes from downtown Birmingham, Alabama, the Quality Inn & Suites hotel offers easy access to the University of Alabama (UAB), UAB Hospital, Summit Shopping Center, Birmingham Zoo and AT&T corporate offices. This smoke-free hotel offers you numerous free amenities, including a full breakfast, and WiFi. Take advantage of our fitness center, our indoor heated pool and our business center, which includes copy and fax services. Relax in our spacious guest rooms, all of which feature flat-screen cable televisions, refrigerators, microwaves, coffee makers and hair dryers. Reserve your room today at the Birmingham Quality Inn & Suites hotel -- you’ll be glad that you did! We look forward to hosting you!